Bubby and Bean ::: Living Creatively: GIVEAWAY // Win a $50 Gift Card to J Avenue Organics! GIVEAWAY // Win a $50 Gift Card to J Avenue Organics! As you guys know, I hold a special place in my heart for eco-conscious clothing companies. I ran one myself for close to 15 years, so I understand the extra challenges that accompany creating a product that is both aesthetically pleasing and genuinely good for the earth and its inhabitants. Now that I'm a mom to a little one, I've grown to appreciate a really great children's clothing line as well. 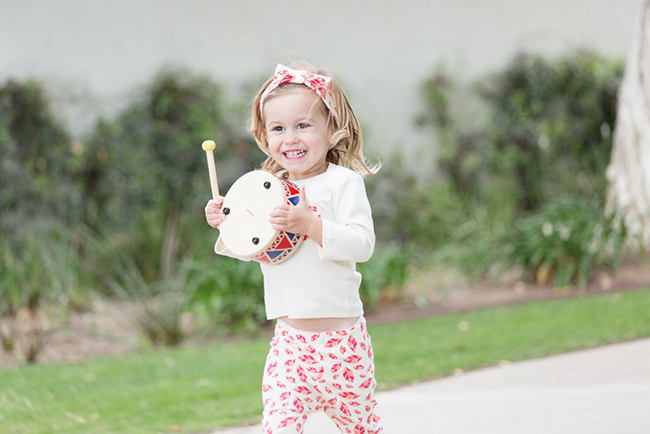 So when I was introduced to J Avenue Organic Apparel - a new brand of super cute, organic, USA-made clothing for little kids - I was an instant fan. Brother and sister team Cote and Calle were raised in a small Southern California town on a street called J Avenue, where they grew up surrounded by family and fun times. 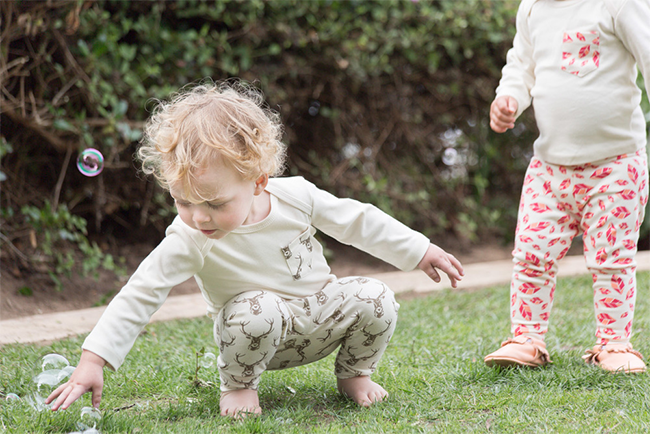 Inspired by the joyful memories of their childhood, they decided to create a company with a mission to bring stylish, safe clothing to children with an emphasis on fun and creative design. J Avenue was the obvious choice for a name. They began to build their brand through the creation of adorable organic apparel for the little ones (and the cutest nursing scarves I've seen), made in California from North Carolina manufactured 100% organic cotton fabrics printed with water based inks and free of harmful chemicals or skin irritants. I ended up getting the Coral Abstract Pocket Square Tee, Pant, and headband for Essley, and I can personally attest to the quality of their products. J Avenue talks the talk and walks the walk, and I can't wait to watch them grow. Lucky for us, Cote and Calle have also generously offered to give one lucky Bubby and Bean reader $50 to go shopping on their website. If you have a little one or your own, or you're an aunt/uncle /grandparent/godparent, or you have friends with kids, this is an exciting chance to get your hands on some of the cutest children's clothes around. To enter, use the form below. There are several entry options. This giveaway will run through June 8th, 2015 and is open to Bubby and Bean readers worldwide. A winner will be randomly chosen shortly after the end of the giveaway and posted here. Thanks again to our pals over at J Avenue Organic Apparel for giving our readers the chance to win a gift card to their wonderful shop! Good luck! My favorite item is Tribal Pant. I love the tribal outfit, so cute!! I love the black striped headband and the match nursing scarf, SO CUTE! The coral abstract pants are adorable! I love the black and white headband! My favorite is probably the elk onesie. i love the elk hat! I love the green striped hat. What cute stuff!! the Elk Pant would be so cute for my boy due in August! I like the Elk Hat. Elk Pants are my favorite item. Thanks for the opportunity.